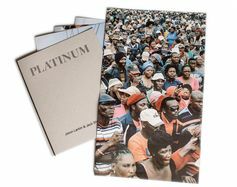 Platinum, a collaboration between London-based writer Jack Shenker and British photographer Jason Larkin, seeks in both content and presentation of text and photographs to remind us that we are after all privileged observers of the events leading up to the massacre of at least 34 mine workers in South Africa’s platinum belt. Larkin has spent a great deal of time thinking about how to make books and get them into the world. The stories he has covered as a photographer in the last several years have compelled him to think about the politics of art books – who makes them, who distributes them and, most importantly, who can afford them. Platinum, the second collaboration between Larkin and Shenker, reflects these sensibilities. Larkin’s photographs accompany Shenker’s essay “Marikana”, a wide-ranging analysis of how South Africa got to Marikana, and how this event might come to define the country in years to come. 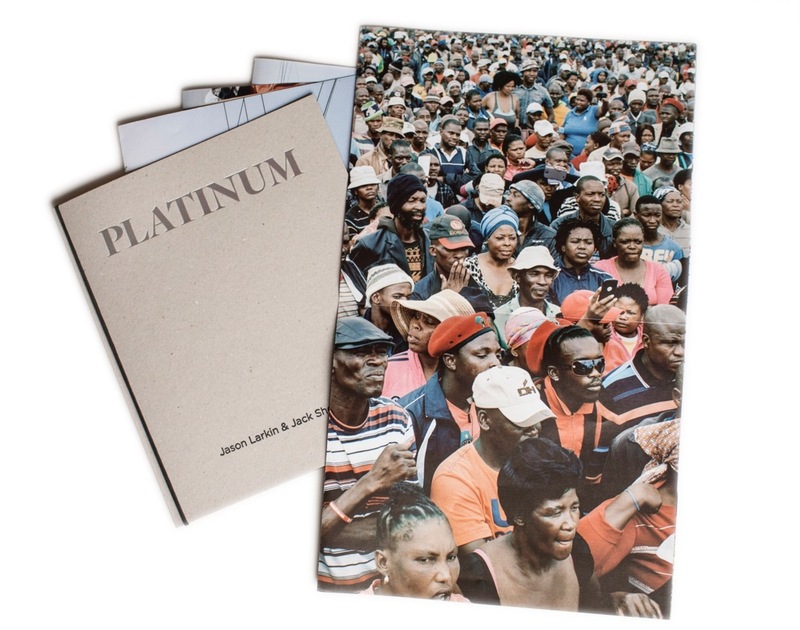 Shenker is unflinching in his criticism of big business and the mining industry, and Larkin’s photographs offer a fairly dispassionate but astute look at the people and the landscape of the platinum belt around Rustenburg. The publication of these two elements of the story takes the form of a loose-leafed folder of sorts: six posters printed back-to-back in full colour, and the essay — in English and with a translation in isiXhosa by Lulu Mfazwe-Mojapelo – as a separate booklet. All are held together with an elastic band inside a plain card sleeve with the title handstamped on the front. The thinking is to disrupt expectations about what a book might comprise, as a way, albeit imperfectly, of reflecting on Shenker’s central theme: that your perspective on things like Marikana depends very much on where you are looking from. The traditional photobook, that usually luxurious, costly publication on heavy art paper, is quite literally dismantled in Platinum. Perhaps this conceptual and aesthetic manouevre will persuade us to look more carefully at what is right before us. Platinum is also in part a gesture meant to include a wider than usual audience. In their previous collaboration called Cairo Divided about the manifestations and effects of the Arab Spring in Egypt, Larkin and Shenker settled on a broadsheet with photographs and an essay in English and Arabic. They felt this was the best way to disseminate the story they sought to tell, but also to exploit the democratic possibilities that a free newspaper on cheap paper represented. It was also a way of commenting, albeit obliquely, on the uprising itself. The success of that publication persuaded Larkin that it was an excellent way of getting another important South African story – about the re-mining of Johannesburg’s golden heaps of toxic waste – into the world. Although his photographs of the mine dumps were several years in the making, the newspaper version of After the Mines was a fast production and the relative cheapness of newsprint meant that it could be sold for a modest US$6.60. And once again, a translation of the essay by journalist Mara Kardas-Nelson, this time into isiZulu, the most widely spoken language in Gauteng where most of the dumps are situated, was an important element of the publication. The aim for After the Mines, and now Platinum, is to bring such stories to public attention as quickly and as inexpensively as possible, and to attempt wider distribution than the usual art-book-buying market. Since the Marikana massacre, each time miners have laid down their tools, strikes have also mushroomed elsewhere across other industries and workplaces around the country. Yet anyone with full-time work does not count among the very poorest in the nation. Statistically speaking, most platinum rock-drillers rank in the seventh or eighth income decile, making them better off than around two-thirds of the population. Given the privations of Nkaneng, one of the informal shack settlements scattered around the mine shafts in Marikana, and other hardscrabble settlements like it, that fact speaks volumes about how grossly divided South Africa’s population has become. But it remains the case that for a huge proportion of the black population, a full-time mining job and membership of a union would represent a staggering advancement of their status; instead they are simply members of the precariat, living insecure, unstable lives with access to piecemeal, temporary work at best, or joblessness at worst. Under neoliberalism, that category of citizen is growing in most developed countries, where enervated social rights and zero-hours contracts are increasingly the norm. In light of the relatively privileged position of those lucky enough to have stable jobs on the platinum belt, it would be easy to dismiss strikes in Marikana as somewhat disconnected from the rest of the country’s strife; an important struggle for the mineworkers themselves, no doubt, but hardly consequential to the millions of South Africans who are unemployed, or homeless, or fighting eviction, or just generally existing in a zone of uncertainty where each day teeters on the very pivot-edge of survival. But any such dismissal would be dangerously shortsighted. To appreciate why unrest here matters, you only had to hang around in Marikana on the evening following the rally in Wonderkop stadium in 2014 where several thousand striking miners gathered, once the pitch had emptied out and dusk had fallen. Behind the silhouette of the Rowland shaft machinery, fires soon appeared above the main road linking Marikana to the N4 highway. Residents of a settlement called Mmaditlokwe who had been forcibly relocated there by a nearby platinum mine the previous year, were protesting at their continued lack of services and their apparent inability to get either the mining company or government officials to take their concerns seriously. Sharp cracks echoed over the surrounding scrubland as demonstrators dragged burning tyres in circles across the asphalt and security forces fired rubber bullets into the air to try to disperse the crowd. At that same moment police were also patrolling a few miles to the east, in the small towns of Bapong and Majakeneng, where local rebellions against economic deprivation had erupted several times in recent weeks. Residents say a three-month old baby died in the unrest after inhaling government tear-gas. An 18-year-old youth in Majakeneng told me by the roadside: "The older generation have been hypnotised by the ANC. Our generation can think for ourselves." Bronwyn Law-Viljoen is Senior Lecturer in Creative Writing at University of the Witwatersrand. This article was originally published on The Conversation. Read the original article.